Who speaks for the Gulf Coast and New Orleans? They do, of course, but why aren’t the rest of us listening? People everywhere go about their daily lives of work, school, shopping, little league practice, etc., while hundreds of thousands of their fellow Americans are struggling to put their own lives back together. Some are stuck thousands of miles from home waiting for when they can return; others are worse off, making do in the wreckage of their former homes with a bucket for a bathroom or sleeping in tents and eking out an existence on food stamps and welfare while holding down a job as a public school teacher. It has been nearly six months since Katrina made landfall. Where is the outrage, and where is the outreach – as a nation? Don’t get me wrong, thousands of individual volunteers (many part of faith-based mission groups) have come out of the woodwork to give of their time, money and labor to help people who are total strangers. I saw it with my own eyes, and recorded it here in an earlier post. But these efforts, while valiant and worthy, are like offering a Band-Aid to someone who has lost a limb. What is it going to take to get our nation’s leaders to bring the full power of our government to bear on a problem that is solvable by, as they say, throwing money its way. The cure to cancer or Middle East peace may remain elusive goals with no clear answers, but rebuilding the Gulf Coast and restoring the protective wetlands can be done with the tools we already have at hand. “New York Times” columnist Frank Rich put it best recently in a radio interview when asked how citizens of this country can begin to demand more integrity from the system. Like the movie “Network,” we need to start communicating a simple but powerful message to our elected officials -- that we are Mad As Hell And Aren’t Going To Take It Anymore! If you can believe it, there are still more than 2,000 people who are unaccounted for in the aftermath of Hurricane Katrina. 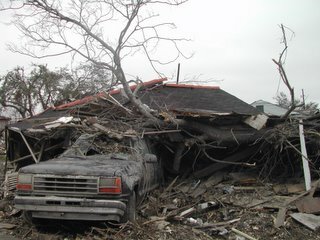 How many of those lost people are bodies still buried in the wreckage of the houses that were destroyed, especially in hard hit areas like the Lower Ninth Ward? Those are all people who have fallen and been left behind by the rest of us. Meanwhile, FEMA is stopping hotel payments for 12,000 families, government run tent cities are set to close, there aren’t enough trailers, many people aren’t in a position to even use a trailer because they can’t connect it local utilities for many reasons, and nobody has any answers as to where any of these people will go. “Even when we try to put a smile on our face, we remember people who are still missing,” New Orleans City Council member Oliver Thomas told CNN correspondent John King during the same Oprah segment. Thomas turned around several days later and made headlines across the country by saying the only people welcome back to New Orleans were those willing to work, not so-called “soap opera watchers.” That sure sounds like code for the largely white voters who remain in the city. It also plays directly into the notion that New Orleans and Gulf Coast residents must somehow prove their worthiness to be made whole. That’s bunk. Prior to the great flood of 1927, Americans had very little expectation of help from the federal government following natural disasters. But Herbert Hoover, along with other community-minded leaders in the South, changed all that, realizing that the plight of the country’s working class was essential to the health of the economy. (Read John Barry’s “Rising Tide” for more on this pivotal moment in history.) It wasn’t even a question of morality or compassion; leaders realized that helping victims of that great flood was the right thing to do for the country’s overriding interests. Have we lost sight of that in the intervening 78 years? The Gulf Coast and New Orleans are breathtakingly beautiful and, in this writer’s humble opinion, one of the most interesting places on the entire planet. It’s a region with a strong sense of place, where families stake their claim and stay rooted for generations. “This is home…the only home we’ve known,” said the matriarch of the Taylor family, whose image appeared on the cover of Time Magazine being rescued from the roof of their engulfed SUV in Bay St. Louis, Miss., at the height of the storm surge. Many fellow storm victims echo this connection when interviewed about their desire to return to these storm prone locales. Comments are welcome on this blog, even anonymously. Hi, my name is Wakako. I am a student from Art Center College of Design (Pasadena, CA). A group of students is working on project for New Orleans....and we're focusing on Lower 9th ward.